I've posted a lot about the Mock Newbery clubs I'm participating in as they occupy a lot of my time. I haven't done as much for the Mock Printz clubs because one is online at Goodreads and the irl one has been reading on their own and won't meet until January 5th or so. But, as I try to line up and complete all my reading in time to judge the second round of YA for The Cybils, I find a need to discuss. Ok, how many of these have you read? Which do you think has the best chance? Are there books I'm missing? What books do you think meet the Printz criteria? I found playon tv. I am able to have Netflix, Amazon Video on Demand, Hulu, CBS, NBC, the CW, etc. running through my Wii! I love it! I can watch it on the big screen. No, the quality is not the best but that is a function of my extremely old television and the Wii connection, plus ATT. I'm sure if you have a better system, like PS3, your viewing experience would be even more amazing. Now, there is a cost. I'm doing a two-week trial and I will decide if I want to pay $20 for a year or $60 for life (sale until 11/30). It's cheaper than cable but you do need to find and load some plugins on your computer. For now though, it's awesome! I've read 5 of the books on my Mock Newbery list since last week which is good. I've only reviewed one of them - it was so moving I had to write something, but that's not enough. I hope to get through six this week and review 3 of them. This should leave me some leeway for other reads too! I have one more on my Mock Printz list to read so that might make it's way on the list.. Only three days of work this week! What are you reading or watching this week? I'm writing over at SJCPL Mock Newbery 2011 today. Great meeting with 22 students in attendance. We talked books, Skyped with Laura, and then discussed the books they thought were the "most distinguished". Read more at SJCPL Mock Newbery 2011 blog. Meridia grew up in a household with a mother who rarely remembers she's alive and a father who wishes he could forget she'd been born. For the first 16 years of her life she wonders if all families are like this or if there's a chance she might find someone who loves her. In Independence Plaza she finds Daniel and she finally gains her freedom. When she meets Daniel's parents she notices two things; it's warm in his house and there's no mist hovering outside. They marry three months later and she moves into their home. Quickly she realizes that although the Orchard Road house is not surrounded by mist, it's infested with bees. They aren't present all the time, only when Eva, Daniel's mother, decides she's losing control or not getting enough attention. The bees are a result of her incessant complaints. Everyone but Meridia appear to be blind to Eva's fault and Meridia soon becomes an outcast and has to take drastic measures to save her marriage. 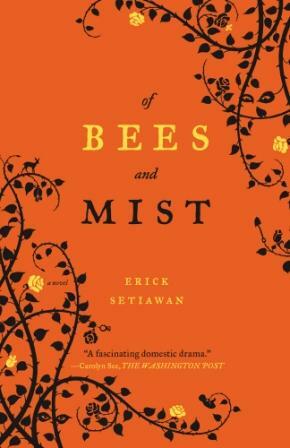 Of Bees and Mist has elements of magical realism as Setiawan gives the mist and the bees human characteristics. Setiawan also incorporates ghosts, spirits and other out-of-this-world beings Many times Setiawan switched so quickly between fantasy and reality it was hard to follow what was happening. You also had to be aware of the time change as the author attempted to weave in Meridia's parents past. I found it a struggle to get through Of Bees and Mist. I became bogged down in the details as I tried to separate what could be a function of the character's imagination and what was really occurring. My confusion was deepened by my lack of feelings for any of the characters. I just wasn't interested in what happened to any of them and much of what did seemed like it was there for the shock value. After crawling through the 400 pages I felt the ending was rushed. I didn't get a sense of resolution and was left with many questions. So many problems were wrapped up neatly and others just ended. Erick Setiawan was born in 1975 in Jakarta, Indonesia, to Chinese parents. A quiet, shy child, he was thankfully raised in a family of gifted storytellers, who taught him that while life might have an endless supply of conflict, not all of it translates into a good story. Due to the anti-Chinese sentiment prevalent in Indonesia, his childhood was often fraught with tension, which prompted him to take comfort in books and in the world of his imagination. To traumatize him further, his parents sent him to Catholic schools, where he learned from an early age to feel guilty about everything and that a grown man in a sash and a swishing robe with a ruler in his hand was in no way maternal. Several years, two failed novels, and countless short stories later, he decided to quit his job to finish writing Of Bees and Mist. At the time, he had no book deal and knew no one in publishing, but he pursued his passion with the same stubborn resolution/delusion that had motivated him earlier. He sold Of Bees and Mist four years after he started it. Thanks to TLC Book Tours and Simon and Schuster for this finished copy. Seb Daniels has finally found a way to escape his family. His little "Hole in the Wall" is the perfect getaway. He's made it feel homey by stashing some of his favorite things and using unintentional castoffs from the family. When he's relaxed and reading or daydreaming, he swears colors start swirling out of the rocks. But, eventually, all good things must end. At home, which is a real "hole in the wall" since it snuggles up near a mountain, Seb shares a room with his twin Barbara, also known as Shish Kebarb. Jed has run away and Pa spends all day drunk and Grum, his grandmother, has taken over his former room. Seb's part of town, the Kokadjo Gore, has been strip-mined and the Daniels own one of the last standing houses. The house is starting to seep up the runoff water from the stripped land and it's doing strange things to the ground and to the chickens. When Seb is up gathering eggs for sale, he finds one that's been solidified. The next thing you know, Stanley "Boots" Odum is at their door offering to buy their land. The same Stanley Odum who's purchased and destroyed all the beautiful wooded areas around the Daniels. The same Stanley Odum who forced their Pa out of a job and then wouldn't let him work in the new company. Seb hated Stanley. There had to be something going on for Odum to want their land so much. Seb and Barbie set to find out and hope they'll solve the mystery of the chickens along the way. Hopefully before the cookie dough solidifies in Seb's stomach! Original story that adds magical realism to the mystery. Fast-paced plot keeps the story moving forward. Some funny parts - Seb is "magnetized" and a chicken gets stuck to his stomach. Want to know what will happen to the family. Values imagination and hard work. Too many different stories being told at once is a little jarring and hard to follow. Too many coincidences - unrealistic. Too many characters mean you don't really get to know them. Resolution wrapped up too neatly. Why wasn't Barbara the narrator? 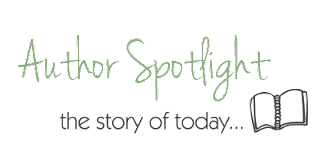 Tune in tomorrow for a guest post by Lisa Rowe Fraustino, maybe we'll get our questions answered. Thanks to Blue Slip Media for this ARC. I haven't done one of these since June or July! Which is when I finished all of my fake challenges and my one real challenge, NO Summer Slide. I'm now working on a new real challenge - read a good portion of the books that are Newbery Contenders. I'm working off a list so that makes it a little easier. The hard part is writing something about each book as I finish it. I'll update my progress next week. Decent but my school year challenge calls for some classic and nonfiction reading. Luckily, I have until June for that. I still need the two reads from our teacher book club, but hopefully they will choose something I'm already planning to read or have read! As I watch the news and see the forecast for snow, it makes me thankful. I.HATE.SNOW! So, what am I thankful for? 1. Heat - It's nice to come home and see the smoke coming out of the chimney as I pull into the driveway. I get inside and kick my shoes off. Ah! Enveloped by the wonderful heat! 2. Garage - An enclosed garage makes the winter that much more bearable. I don't have to scrape off the car or wait until the car "heats" up. Nice. 3. 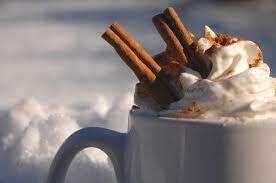 Hot chocolate - Mmmm, add some marshmallows and whipped cream, need I say more? 4. Slippers - I have those fake Ugg kind with the fur inside. So warm and cozy! 5. Down Comforter - I just wrap up in it and float away to happy land! Although I don't enjoy cold weather, I do enjoy some of the gifts I use more often then! 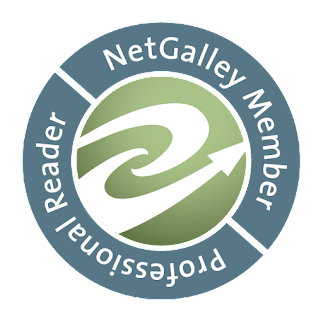 Are You My Newbery 2011? - Who Are Your Top Contenders? School Library Journal Heavy Medal Blog- Jonathan and Nina have listed their top 8 which includes a mix of genres. They've also included a link to the Newbery Manual! Laura's Life - Laura has listed her top 5. She's read ALL the past Newbery winners and hosts her own Mock Newbery club. Eva Perry Mock Newbery - The Eva Perry library Mock Newbery club posted their top titles. These titles were chosen by teens. St. Joseph County Public Library Mock Newbery - Kris has posted her third list. Full disclosure - I contribute to this blog. We would really love your feedback! So, go check those out and come back and tell me if you agree or disagree with the choices. I loved how Matson interlaced the road trip journal with the state playlists and other ephemera. I was always happy to find a song I knew on the list and to read some little known but fun fact about the state. I watched Amy's growing interest in Roger and wondered when he would figure out how her feelings were changing towards him. I found it hard to believe that a 17 year old would be left in a house alone for a month so soon after experiencing a tragic accident. I also had a hard time believing a mom would let said 17 year old drive across the country with a boy she hadn't seen since they were children. But, once I put those thoughts on the backburner, I was able to enjoy the story. Matson's writing is vivid and you can get a clear picture of the characters. As Amy and Roger go on their quests for closure; Roger to determine why his girlfriend left him and Amy to understand her role in her father's death, you can see how they mature. It's time for me to start reading in earnest to see if I can pick the Newbery before the committee. I also have a few more books I want to read before the vote comes in on Monday, January 10, 2011. In order to challenge myself, I'm going to try and read all the books on The St. Joseph County Public Library Mock Newbery list. I'm going to list those books on my Are You My Newbery 2011 page and update as I go. There are some books on the library list that I've already read, so I didn't include those books. In addition to those books, I have some blog tour books, Harry Potter 7, The Voyage of the Dawn Treader and a few other books I want to read. All in all, there are about 70 books I want to read by January 9th! Join me!